Intersections artist Arlene Shechet discusses her work Seeing Asteroids and For the Forest (in response to Forrest Bess‘s The Asteroids #1-4) as well as her work Once Removed. All works discussed on view in the artist’s Intersections installation for the Phillips, From Here On Now. Intersections artist Arlene Shechet discusses her work The Possibility of Ghosts and Never Tell, both on view in her installation at the Phillips, From Here On Now. 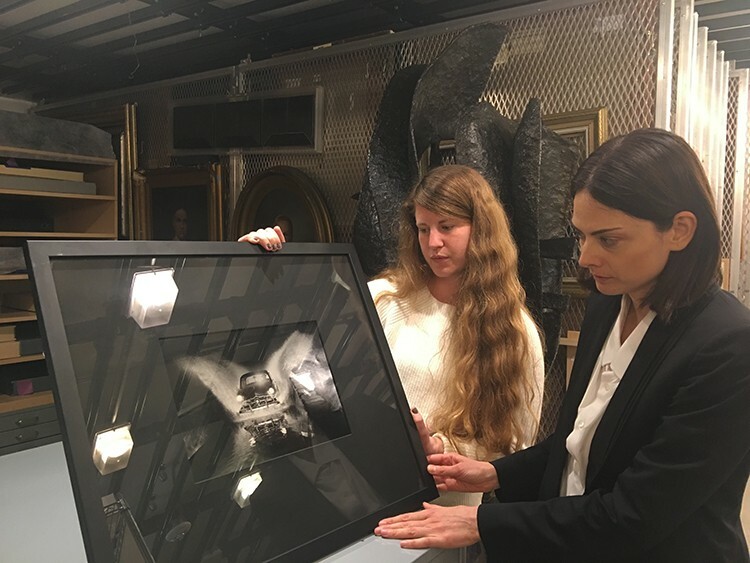 Bettina Pousttchi stopped by earlier this month to consider works from the museum’s permanent collection to display with her own in her upcoming Intersections installation opening in June. Five of Pousttchi’s Double Monuments will be on view with a selection of the Phillips’s photographs, including the above image by Gjon Mili, Ford Car Being Driven through Deep Water at Ford Test Site, Detroit, MI (ca. 1948).